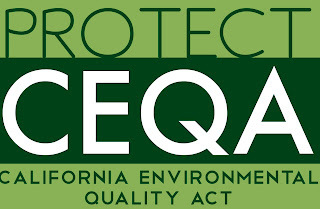 As I noted not too long ago, the California Environmental Quality Act (CEQA) is under attack. Unfortunately, Governor Jerry Brown seems to be one of the attackers. Governor Brown used to be an environmentalist (he actually appointed me to the State Air Resources Board, once upon a time), but this may be a case of "that was then; this is now." At any rate, when the Governor wants to get a law changed, he has a lot of leverage. People who care about CEQA, and who don't want this law either weakened or eliminated, need to let their State Senator and State Assembly Member know, and right now is the time to do that. You can find out who your representatives are by clicking right here. Attempts to compromise the scope of CEQA review, or [to limit those] who can enforce the statute, do not make a project's impacts go away. [That] simply shifts the burden of who will bear the impacts or costs of mitigating them. CEQA, in requiring those who benefit from a project to internalize its environmental costs, ensures that local cities, counties and the public at large are not left to suffer a project's impacts, [and are not] forced to pay for mitigating them, while those who reap the economic benefits laugh all the way to the bank. What Keith Wagner is saying (and he is absolutely right), is that attacks on CEQA are just another way that the 1% is trying to make the 99% pay. Think about it. Then, contact your legislators and tell them to protect CEQA!